Before saying farewell to Easter, we have a genre piece that is worth a read and something to consider. This year marks the 50th anniversary of the booklet written by Alyce Bergey entitled The Beggar’s Greatest Wish. The book was written with one theme in mind: The greatest wish of one person. If there was one wish that you had that you wanted badly, what would that be? Everyone has one greatest wish, no matter the circumstances. Some who are crippled wish to walk again. Others suffering from poverty and other forms of adversity want to be rich. Those who fail constantly want to succeed just one. Yet most of us want peace after suffering from years of conflict, both home and away. For the main character, Barthimaeus, an old man living in a one-room hut outside Jericho, he wanted to see, for he was blind and was a beggar wanting to find a place in the world, but was rejected by many. Day in and day out, he begged on the street and got next to nothing from the public. Every day he was ignored, spat upon, degraded and taken pity. Yet later in the story, his luck started to change beginning with him receiving a single coin and then culminating to his encounter with Jesus Christ, as He and his followers were walking down the streets of Jericho. He found the beggar and after learning what his wish was, his life changed for the very best. Based on the story of Luke 18:37-45, the theme of the story was believing in miracles and how they can come true through faith and fate. Faith has to do in the belief that if one works hard and prays for the most important thing in life, it will come true. Fate has to do with encountering the unknown and having that wish granted. It can be through the encounter with the Lord or another person. It also has to do with certain events that puts the events in order of sequence that eventually culminates into one’s wish being granted. Expected or unexpected, each of us have a special wish based on our trials and tribulations which eventually come true through our own actions and belief. If we didn’t have them, we would allow our world to unfold in front of our eyes that would not be to our best advantage. When Jesus died for our sins, He left us the belief that miracles can happen if we have the faith and courage to make it happen- if we pray and also do our service. It goes beyond the fishermen story when Jesus came from Heaven to give them fish to feed themselves and their families. It goes beyond Job’s struggles when he lost everything to famine and drought and he got that back. It even goes beyond our own personal wishes in real life- mine has to do with putting an end to global warming and polluting the oceans. While this book was written for children but has an explanation for parents, the theme is the same. It’s more of a question of what we have for our wish and what we can do to make it come true. Typical for the region: Easter fountain. Taken last year, one will see many of these in German communities- the Osterbrunnen (Easter Fountain). More on its history can be found here. in den Blumen sind zwei. Bikers being blown off by high winds, high waves causing local flooding and damages, flying carousels, and trains eating fallen trees pretty much sums up a day in total chaos throughout Germany and central Europe yesterday, as the storm Niklas blew through the region, with winds gusting up to 190 km/ph or 100 mph. Many downed trees and flying debris caused damage to overhead powerlines on rail lines, thus bringing rail service to a standstill in many parts of the countries. In Bavaria, Lower Saxony and North Rhine-Westphalia, rail service was suspended completely, forcing many trains to stop at the nearest train stations and personnel to provide lodging possibilities for tens of thousands of stranded commuters. In Lower Saxony, one regional train was unable to stop in time to avoid a falling tree. In many cities, such as Munich and Berlin, light rail (S-bahn) services were halted. High winds also caused many semis and even cars to flip over on German autobahns, causing many to be closed for long periods of time. Flights in and out of Frankfurt and other cities were cancelled due to high winds. Even some festivals, like the annual city market in Flensburg, were called off due to flying debris and high waves. Snow was reported in the northern half of Germany, in places like Rostock and Hamburg. The storm is believed to be one of the worst in recent history, comparing it to the storm Kyril, which devastated many parts of Europe in February 2007. There, high winds and torrential rainfall caused extensive damage, power outages in entire cities, like Magdeburg (in Saxony-Anhalt), and the first-ever shut down of rail service and highways on a federal level. 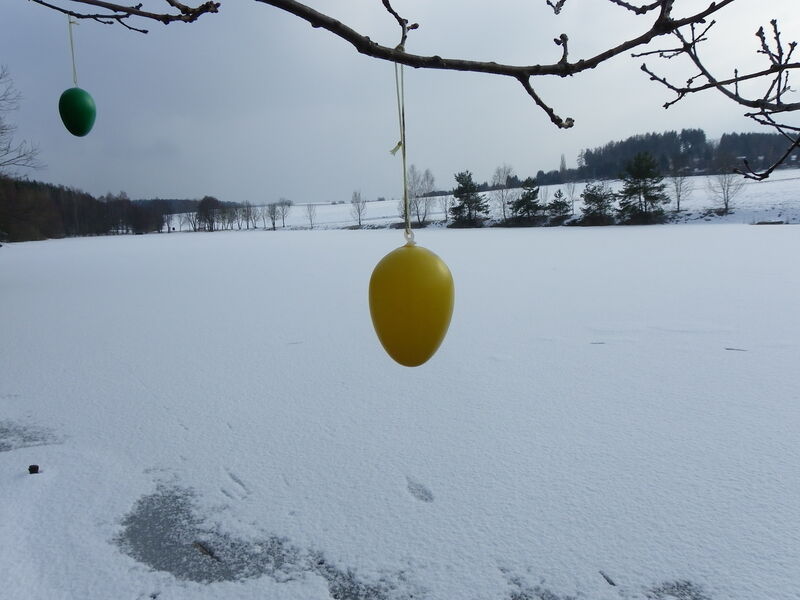 Wishing you safe travels and make the best of Easter despite Old Man Winter’s attempt to try and ruin it! More Bike Space Needed, Please. This Easter kicks off the start of the biking season over here in Germany (and parts of Europe). After months of having the bikes in the garages for many months due to a rather wintry season with more snow than what the continent is used to, cyclists, like yours truly are taking advantage of the warm and sunny weather by packing the bikes and whatever they can use for on the way and head hundreds of kilometers away from their homes to their destinations, so that they can see many new places and pedal many kilometers, whether it is a nice 20 km scenic tour or a marathon of over 110 km long. It all depends on preference mainly, although some people go to extremes only to pay the price physically in the end. For many who are taking their bikes with to their destinations, it is not unusual to load them up on the trains and take off with them. It’s easier than having to load them up on top of their cars or in the back of their trucks, and one only needs to pay for train fare for himself and the bike. 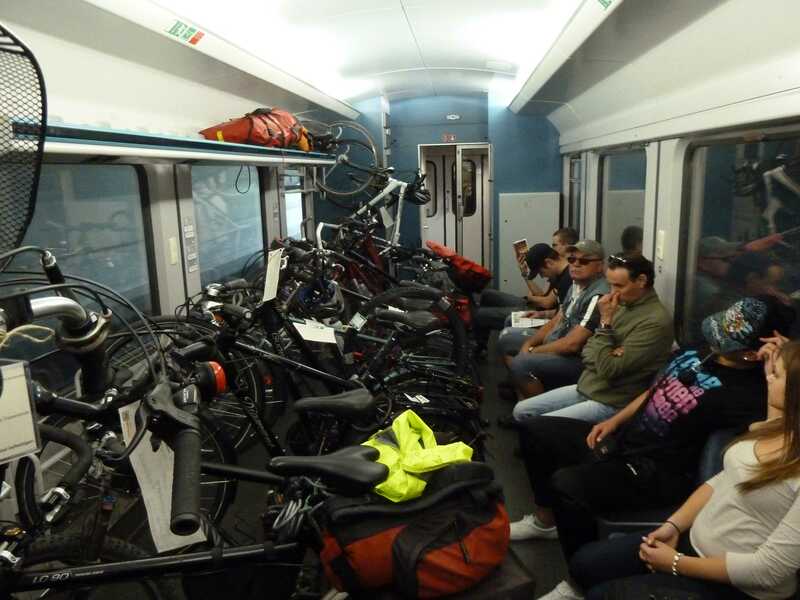 Sadly though, as you can see in the picture, the German Railways (Die Bahn) are trying to indirectly discourage that possibility, as there are too many bikes clogging up the train. Now why would railway services, like Die Bahn would want to do that? The explanation is cause and effect. In Germany (and you can also include the rest of Europe as they have the same issue), it is too expensive to own a car. Apart from the very high gas prices (please refer to my last column on dictating our driving habits), one has to worry about paying taxes for the car- let alone car insurance which is twice as expensive as in the United States (in most cases). Furthermore, it is obligatory to have your car inspected annually to ensure that it functions properly. The so-called TÜV inspection ensures that cars that do not meet strict requirements, such as reducing carbon dioxide emissions and eliminating harmful gases produced by the exhaust system, the car engine making minimum noise while in operation, and the outer body looking like brand new, are taken off the roads unless the problems are corrected. In a way, it encourages more business on the part of the car dealers and law enforcement agencies and safety on the part of the drivers. But by the same token, it discourages many drivers from purchasing a car and use alternative forms of transportation instead, such as bus, streetcar, bike, and the train. Problem with the alternative with train and bike is not just the overcrowding of bikes, but the lack of availability of coaches to store the bikes. While one can take their bikes onto a regional service train at no cost (most of the time, that is), these trains stop at every single train station at every town, big or small, resulting in the travel time being three times as long as it would be, if one would use long-distance train services, which travels faster and stops at only the big and most popular stations, like in Frankfurt (Main), Dresden, Berlin and Hamburg, for example. The fastest long-distance train service in Germany is the ICE, which travels up to 300 km/h. The second quickest is the Inter City, which can clock in a maximum speed of 250 km/h. Yet the IC is the only one that provides the cyclists with the possibility to take the bike on board, even though they have to reserve a spot at a small price. The problem with this possibility is the fact that the bike reservations on the ICs are as limited as the number of these trains that are still running on the tracks. And it will only get worse in the next decade, as many changes by Die Bahn is forcing many to either adapt to the changes or consider alternatives. First and foremost, the ICs are retiring, as many of the coaches have been in operation for 30-40 years and despite consistent renovations, they are approaching the end of their useful lives. At the same time however, the newest version of the ICE, the ICx will make its debut as early as 2017, which will make the ICs and the first two generations of the ICE trains obsolete. There are currently four types in operation: The ICE I, which has been in service since 1990, the ICE II (since 1993), the ICE T (since 2000) and the ICE III (since 2004). All four of these types cannot accommodate the bikes and are therefore forbidden to take aboard unless one wants to face legal action. Also disturbing is the possible elimination of ICE routes as they are either considered non-profitable or are being bypassed with more efficient routes. This includes the weaning of the route Stralsund- Berlin-Leipzig-Weimar-Erfurt-Kassel-Dortmund-Cologne off the ICs and replacing them with regional services, which has caused some massive protests from those who want a quick route to either the Cathedral in Cologne and points in the Ruhrgebiet (an industrial area where Dortmund and Cologne are located) or the Baltic Sea, in places like Stralsund, or the islands of Rügen and Usedom [Oooh-se-dome]. Another route, the Berlin-Leipzig-Erfurt-Nuremberg route is getting a new route, which would go through Suhl instead of Naumburg, Jena and Lichtenfels and with that, the treacherous mountains located between Saalfeld and Lichtenfels. While it may cut down the amount of time because the trains will go through a series of bridges and tunnels, there are concerns that Jena and Naumburg may end up without long-distance train services, a discussion that was brought up last year in Jena, as the city of 120,000 inhabitants is the center of its optical industry and has two renowned universities that are focused on the sciences. Regional services do have three advantages. First it better serves the communities as the trains stop at all stations and towns, big or small. People are more connected as they meet and get to know each other, and one can load their bikes on the train and take them to their destinations, no matter where they go, for free. But this privilege will not last for long. 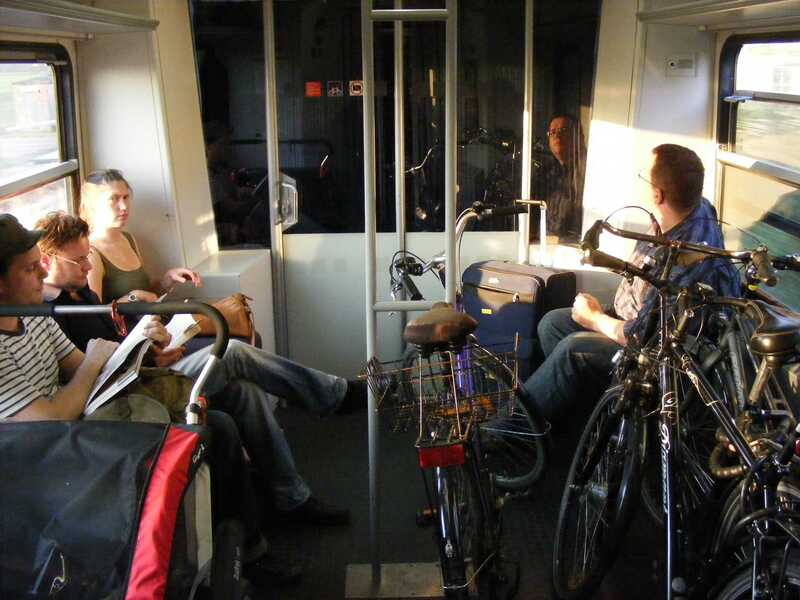 Already in some places, like Hesse, the trains now have limitations for the number of bikes allowed on board. And in Bavaria, bike fees are being imposed on certain routes. One wonders whether these restrictions will actually do more harm to Die Bahn and its profits, let alone the customers; especially those who do not want to resort to the car to load their bikes and go to their destinations, if they can help it. Inside a regional train service enroute to Flensburg. Photo taken by the author. While the situation is still bearable, it will be a matter of time before the frustration between the customers with the bikes and Die Bahn come to a boil and that solutions offering flexibility will have to be found. This includes looking at neighboring countries for references, as their systems are more complex but more logical than what Die Bahn is offering. This includes the rail service in Switzerland (the SBB), where bikes are allowed on any train regardless of whether it is the regional services or the quickest service, the ICN, which runs services between Basel, Geneva, and Zurich. The reintroduction of InterRegio services, which was discontinued in 2006, would provide passengers with better connections to medium-sized communities and more space for the bikes. This is one service that the SBB still retains alongside its InterCity services. And lastly, to better serve the customers, having more train services running regularly- namely three per hour in the more populated areas- would provide the passengers with more opportunities to travel and trains with more space for the bikes. This is being practiced in Switzerland; especially in the corridor of Geneva-Montreaux-Bern as well as Montreaux-Sion-Lugano, for example. Whether Die Bahn will look to other sources for references or find other creative ideas on their own depends on the costs, let alone the supply vs. demand- namely what the customers want and what the rail service can provide them in order for them to be satisfied. No matter what the case may be, many people are not going to let any train service put them down. They will do whatever it takes to travel by train; especially now because of the increasing oil prices, which shows no signs of slowing down at all. And on a beautiful weekend, like Easter, with temperatures between 20 and 30°C and mostly sunny skies, many people, like myself, are taking the bikes into the trains and travelling to their destinations, where they will hit the trails and see the places that they want to see, but without the use of a set of wheels that has guzzled one liter of gas too many. LINK: http://www.bahn.de/i/view/GBR/en/trains/overview/ice.shtml (All the information on the trains of the German Railways Die Bahn can be found here).